Obituary for GARY LYNN RISNER | Herald & Stewart Home-Funerals, Inc.
Gary Lynn "J.J." Risner, husband of Sherry Grooms Risner, of Mt. Sterling, passed away Saturday, January 19, 2019. 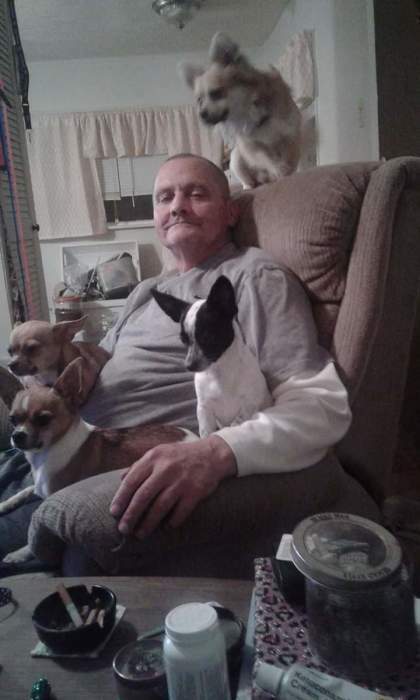 He was a 52 year old native of Magoffin County, son of the late Carl Jay and Sarah Risner, a retired horse trainer and a member of the Christian Faith. His hobbies included reading and training dogs, watching westerns, yard work, gardening, and most of all, helping others. He also loved the University of Kentucky Basketball. In addition to his wife, he is survived by 2 daughters, Carla Moore and Selina Lyman, 2 grandsons, Christopher Moore and Jacob Johnson, 2 sisters, Sandra Risner and Nichole " Nikki " Frazier, and 1 brother, Carol Ray Risner and a close friend, Casey Miller. He was preceded in death by a son, Anthony Lyman, and a grandaughter, Micah Johnson. Visitation is 5:00-8:00 Thursday, at Herald & Stewart Home for Funerals, with a funeral to follow at 8:00. Burial is Friday at Patrick Cemetery is Salyersville. Pastor Dale Fawns will be presiding.